This one has always been my favorite. Every computer that I ever had (work or personal) has been graced with this image. It's so beautiful and calming. Love this - my favourite is the cat. Any chance of having a large cat in a version of your Portals - leaving out the humanoid? Nicely developed, Ryan; the canine's a great addition. This a view I'd love to have. This is magnificent in its grandeur we only look up to see the stars yet to overlook a whole galaxy and rule it is beyond imagination! I have used almost every BG Ryan has made, yet I keep coming back to this one. Has to be my favorite. This has always been my favorite one from the beginning years ago. It has been on every computer I have owned. Looking out through the windows is just so relaxing. Sometimes, its more interesting to look on then participate. This is a great update of one of my all-time favorite wallpapers. Awesome job! I have *always* loved these fantasy styled pictures. Arcana and Portals are a couple of my favourites, but this is lovely too. 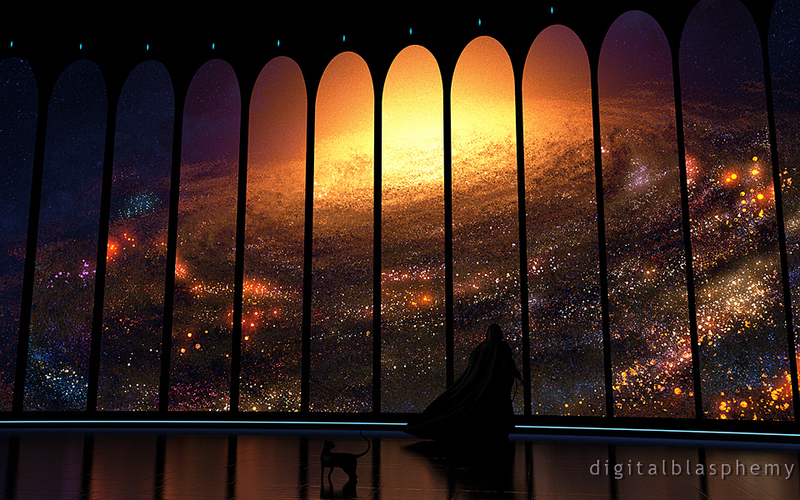 I love the perspective - you can really see how the figure IS the Overseer. Or is he? Anyone that has been owned by a cat truly knows who the Overseer of a house is! I don't comment often, but this one is over-the-top good. The dual-screen perspective is fantastic. Instantly one of my favorites! "To get an idea of what I was talking about"
In "Portals" you angled the images to give a different perspective for each section. I feel this is what would really make this piece come together for me. I bet it will not be nearly as easy angling each "window" and keeping it lined up as it was angling the ones in "Portals". Also, like I said before, it would be neat to put "Overseer over more different wallpapers. Not just space ones, but I think it would be neat over your 2010 "Subarctic" with the Orca. I really like what you have done with this. The original has always been one of my favorites. However, once I set it as my wallpaper on my laptop (1920x1080 HD) I noticed that the perspective is wrong. 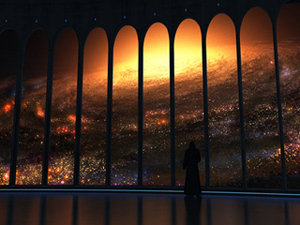 Each "window" looks more like a panel that was placed there, rather than looking through at the galaxy. 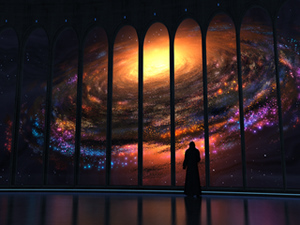 I'm not sure if you cut and overlayed the galaxy onto the overseer or visa versa, but the curvature of the image seems off. I don't know if you can "bend" the galaxy image to match the curve of the floor. But overall I really like the concept. 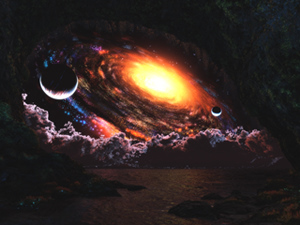 I would love to see you overlay the Overseer onto other wallpapers of yours. A long while ago, 'The Overseer' was among the reasons I decided to buy a lifetime membership. I'm so glad you decided to update it. i really like the triple-screen variant the best, i'm using a crop of that instead of the widescreen. The original overseer is one of my favorites. The updates to the figure and the floor and the addition of the cat are great. I still prefer the planet with moons to the galaxy though. The cat's a very nice touch, too. Ohheckyeah this is a 10. Love it. Really happy you are giving it it's own spot and the little changes are perfect.